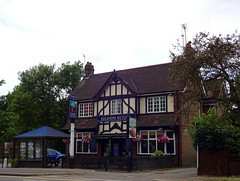 John Barras (Greene King) pub on the Ickenham/Ruislip borders. Entry is into a bare-boarded space with high table and stool seating. Further back around the curve of the bar is a carpeted area with normal-height tables and upholstered chairs with arms. Menus and condiments sit on the tables here, suggesting a significant amount of food trade. Kake visited on a Monday lunchtime in July 2017. I arrived shortly after their opening time of noon, almost simultaneously with two other customers who seemed to be regulars, and a couple more regulars turned up a bit later. Music was playing, not too loud. Service was friendly. The handpumps were clipped for Greene King Amplified (a limited edition pale ale that according to their website is only available in selected Greene King pubs) and Old Golden Hen. A large lime and soda (about a pint, possibly slightly less) was 92p. Food is served all day from a chain-wide menu. In July 2017, Kake tried the all day breakfast (£6) photo, which included two pieces of bacon, two sausages, two fried eggs, a grilled tomato half, fried mushrooms, baked beans, chips, and toast. This had a good balance of components, not like those breakfasts where you get half a plate of chips and tiny portions of everything else (though there were still more chips than I could finish). The eggs had runny yolks and properly set whites, and the sausages were decent quality. The bacon was a bit overcooked and hard. The beans were a bit lacking in sauce. The tomato actually tasted of tomato (no doubt helped by the time of year) and the chips actually tasted of potato. Accessibility: A small step in, no more than an inch or so. No steps once you're in. Last visited by Kake, July 2017. Page last edited 2017-07-13 14:09:12 (version 1).